I am just wondering when allergy season will end, I think this year it’s been a bad year and I have to chose between allergy pills that will stop the itchy eyes, sneezes and runny nose but make me so sleepy and drowsy or continue life being congested and still drowsy. At this point, I don’t know, I just want to function normally. I understand that complaining about something so minor is silly when half of the planet is dealing with life and death situations, so I will just focus on simple food that is easy to make and that remind me that delicious food can help alleviate some minor discomfort. I usually serve this flavorful salad just simply the way it is, as a salad, or with melting potato bouchées or grilled fish. All the vegetables have been grilled and they blend together beautifully, they remain crunchy, and have their natural flavors enhanced by the hot grill. It takes about 15 minutes to make including the chopping of the vegetables and grilling, so I consider this a “fast food” dish. Fast food literally meaning food that is prepared fast, in my kitchen, I don’t associate it with unhealthy and processed food. Now if you want simple, quick and delicious, this is the one, but it’s also peu calorique! (low in calories) so even better. I noticed a lot of people are on a diet or trying to lose weight, I guess that’s a sign summer is on its way and that swim suits and light revealing clothes too. As far as San Francisco and its beaches are concerned, you might need a scarf and wind jacket instead of a swim suit…I just want to dream of a swim suit…and thinking about it, I don’t remember when was last time I wore one of those. I love cuisine sur le grill, the beauty of it is that you can grill anything, vegetables, fruits, potatoes, just about anything you want while keeping all the flavors, the colors and shapes of your ingredients. Baby roma tomatoes are perfect for grilling because they’re firm and slightly bigger than cherry tomatoes and a lot sweeter, so you can grill them easily, they will remain firm but need to grill them quickly at high heat so they won’t get mushy. Combine oil, mustard, lemon juice, capers, salt and pepper. Stir well all ingredients together. 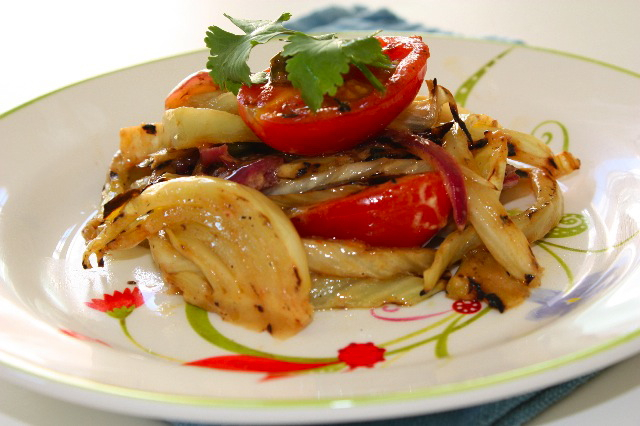 Using a grill pan, grill all vegetables, starting with the fennel, the onions and tomatoes. Place them in a mixing bowl. Add vinaigrette on grilled vegetables and serve with favorite fish or savory galettes. This entry was posted by silvia on April 22, 2010 at 10:38 am, and is filed under Express - Less than 30 minutes, Salads. Follow any responses to this post through RSS 2.0.You can leave a response or trackback from your own site. Oh no…I hope your allergy is over soon. I have seen a lot of my friends suffer very badly. Your dish indeed looks simple and delicious. I like it. I have not tried grilled fennel. I would love to try. Oh La La, C’est bon ça! anything grilled is right on my list yum, but will sub garlic for the onions, have some ready to try great recipe! this looks great, just beautiful!! This vegetables look simply delish! I like it warm, thank you! Have a great weekend, Silvia. Simple, elegant, and quick. Three fabulous words on a busy weeknight. Love the mustard caper viniagrette. Good luck with the allergies, I can really relate. Cheers! A sign of warmer weather. 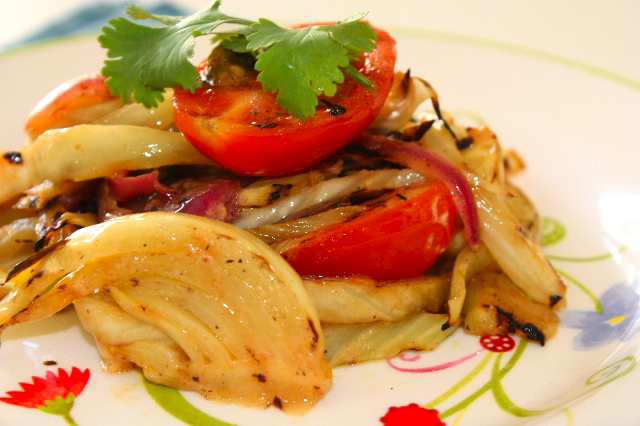 Grilled veggies are so much more flavourful and delicious. Love the combination of all different kinds of flavours of veggies. You can’t go wrong with fennel! Like bacon, it makes everything taste better! What a beautiful salad! Time for the grill! Excellent salad! I feel your pain with your allergies, this has been an exceptionally bad year so far……but on the good note, being new to fennel bulbs, I had not thought of grilling them…that must make them taste incredible….wow…and the salad is perfect. What a fabulous salad. We don’t get fennel because where we live in the mountains the supermarket doesn’t carry it very often and when it does, it doesn’t look fresh. I hope to find it at our local farmers market this spring. When I do, I’ll be trying this great salad. Lazaro was right – you are very talented and it’s a pleasure to meet you and read your great blog. And I hope allergy season ends soon too. I think I may be allergic to spring. Hi, nice to be acquainted. Lazaro is absolutely right about your work, congratulations is awesome. Lovely recipe and wonferful colours. Also, THANK YOU for the camera help! I LOOVE your blog and your photos so it was very helpful to hear! Beautiful presentation…I heard of you from Lazaro Cooks. This salad looks delicious! So Fresh! The amazing Lazaro sent me over. I’m so glad he did! I’m looking forward to reading your delicious blog. Lovely! I cannot wait to try this. Claritin – nondrowsy antihistamine of choice! Quelle découverte ce blog! Je me réjouis d’avance! J’aime beaucoup cette recette surtout que je n’ai jamais utilisé de fenouil mais je laisserai les capres de côté! A gentle grill can easily bring out the flavors of fresh natural ingredients like these. YUm! We love fennel at our house, but I usually just roast it all by itself. I love this dish! The Dijon would give it some extra zip and the lemon some lovely freshness! Excellent! hope you’re feeling better! the pollen was out of control this year. this salad looks beautiful and i bet would pair well with pesto pasta. Thank you a bunch for sharing this with all people you actually realize what you’re speaking about! Bookmarked. Kindly also seek advice from my site =). We can have a hyperlink alternate arrangement among us!